What is the best glue for leather? Buying a good pair of leather shoes, for example, may be easy, but not when you need to repair them later. Over time, leather products suffer from damage. When it happens, you don’t need to bring your leather wearable to a shop–super glue will help. If you’re looking for the right glue for leather, then you have come to the right spot. We’re reviewing the best glue products on the market to help you fix leather, suede, and other surface materials. Looking for the right product to help on the matter is what’s making things confusing. There is a ton of possibilities and categories out there, meaning more research is what you need to shop around for glue to help you with the application. Whether you’re looking to fix leather, maintain it or help you with your craft, then you should choose the one with the strength and suitability for the job. One unique feature to look for is the speed in which it bonds with leather, plastic, rubber or any material you’re looking to bond it with. You can measure it in seconds, and the factors that affect the speed are materials, performance grade of the glue, and the environment you’re working with higher humidity and warmer environment, the glue will bond quicker. If there is no mixing involved, the glue can be used in an instant. That is one of the features to look for when searching for the best products. Finding the right glue, you do not have to mix or combine different components for them to work. Super glues are versatile and can be used on any material, aside from leather. They can also bond with ceramics, metals, glass, and many other types of plastics and rubbers. It’s one of the reasons you must select glue that works well with the material type you’re bonding it with for the best results. Versatility is one of the most important factors when shopping around for an adhesive. You should be looking for one that works for many applications. But if you’re bonding fabric material, you must use a rigid adhesive though. Super glues are strong, aside from them being able to bond easily and quickly. Again, there will be a difference in their performance based on the materials, environment, and grade. In general, super glues are strong versus MS polymers and silicones. Some glue sand well, but not all of them. If you’re looking to sand materials once they have bonded, you must consider certain factors. Types that sand well include epoxies, PVAs, and super glues. Those that won’t include rubber cement, goop and PL 200. If you’re looking to keep the glue invisible, check the visibility of the glue you’re looking at. To help you decide, you must remember that solvent-based adhesives leave a stain residue on porous materials. On the other hand, white glue or wood glue, also called PVAs, seals porous materials. They also prevent treatments from acting on the material. If you’re looking to stain the material once glued, clean up the surface well. For bonding materials with small gaps, you should look for glue with viscosity to fill in those spaces. There are epoxy putty products to use for this application. If not, you might have to use and add your filler to make a gap filling glue. Baby or talc powder can be combined with epoxies, slowing down the curing process. On the other hand, white PVA glue, and wood glues may require sawdust for this purpose because these types need air circulation. If not, they will not adhere and dry. You must not apply it too thickly. There are different types of glue per application. Some of them need a warmer temperature to bond; others require only room temperature. Generally, PVA can set in above zero temperatures provided the surroundings have enough air circulation. In addition, contact cements and solvent-based adhesives can work well in temperatures above zero as well. The best glues are budget-saving because they do not require much amount in every application. Versus generic glues on the market, they are tougher and stronger made with high-quality materials. In fact, just a drop of it is sufficient in covering an area of 25 millimeters. Avoid using too much of it because it will only reduce the bond strength and curing process. Generally, super glues work well even when used in small amounts like a pen tip. Aside from choosing the right glue for leather and other materials, you must select the best adhesive product factoring in the cost. For one spray, adhesives are costly and they don’t go as far as other paste or liquid adhesives. If you’re not looking to use it for the smoothness, then skip it. Cyanoacrylate isn’t cheap, but it goes a long way with only a small amount required to complete the job. In all cases, you should keep the glue properly to avoid it evaporation and dehydration. If you’re looking for an easy to use but strong adhesive, then you may consider Gorilla 7700104 super glue gel. The viscosity of this glue is best for working on different types of surfaces, including leather. The product is well designed and engineered for long-lasting repairs. Users looking for a quick drying formula can rely on this adhesive because it dries in 45 seconds. Gorilla 7700104 is also created to absorb any level of impact, shock, and drop. Its high performance makes it highly reliable. The container comes with an anti-clog cap that helps in ensuring the packaging is airtight so that you can use it again for future applications. Users can also make use of it on vertical surfaces for its fast-setting formula that requires no clamping at all. 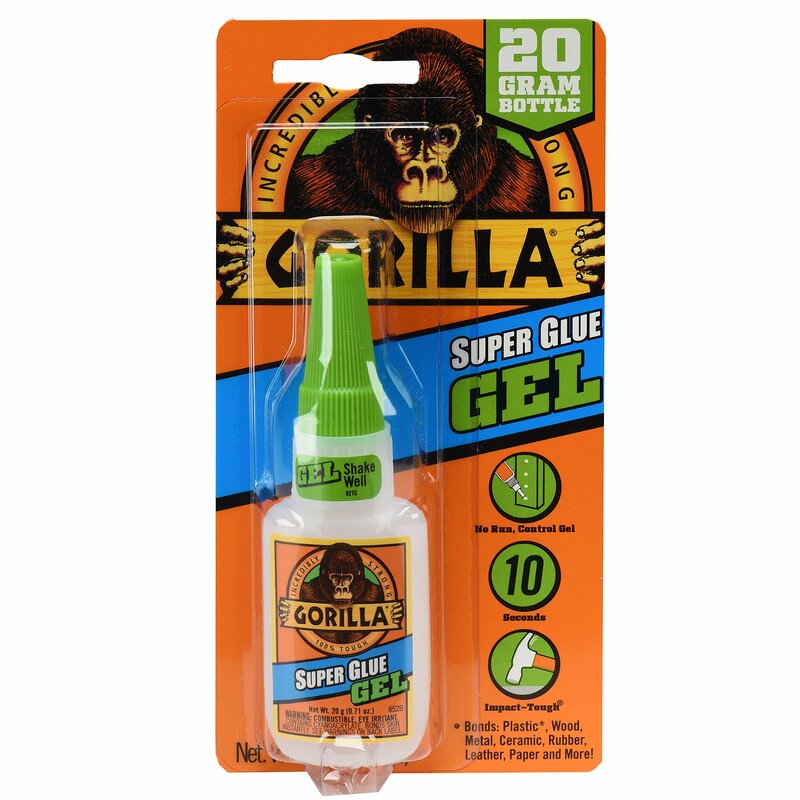 If you’re looking for a versatile adhesive to work on ceramic, plastic, wood, paper and leather, among other materials, then you may want to consider this Gorilla super glue gel. Overall, this product is one of the best around in its category. It won’t give you any hassle. In fact, you don’t need to mix it with other materials to start using it. You can also reuse it for future applications because it won’t dry up for its airtight packaging design. This is a no smearing, smooth formula that bonds well and stays firmly when glued on leather shoes. It is a commonly chosen product by shoe repair people for its ultimate bonding ability. This cement glue is made with a neoprene ingredient so it must dry within 15 minutes. Regarding long-lasting repairs, users can rely on this product because it is also waterproof, so it must firmly bond with the material without you worrying about it once done. The glue is also perfect for industrial uses and works with only a small amount applied. Users looking to save money may want to choose this adhesive for their tasks. 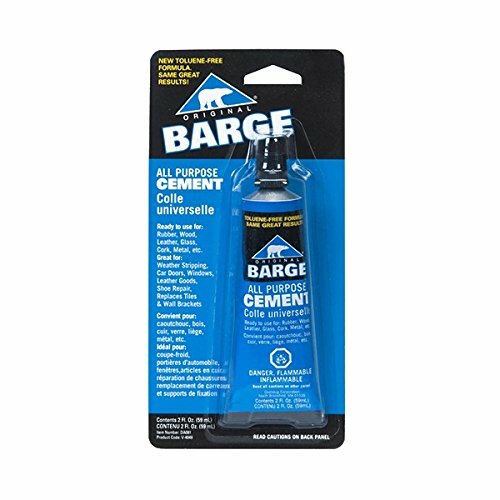 Barge All Purpose Cement is also easy to spread and can be used for a broad range of applications and materials, including wood, rubber, leather, fiber, glass, woven and synthetic fabric, aluminum and steel, nitrile, neoprene, cotton, EVA, SBR and gumlite. Proper application is needed to avoid peeling away. The leather and suede glue is the shoesmith’s best friend. The product works and dries well for an even and smooth surface. Just make sure to apply it correctly to avoid peeling away. This product works best for repairing items, including belts, purses, and shoes. It can also be used for your crafts without any hassles. It dries quickly and provides instant invisibility, perfect for beadwork and bonding fringes. The glue is ideal for hobbyists and people who love craftworks. It bonds permanently without any hassles, so it is dependable for long-lasting repair and applications. This suede glue also works compatibly in fashion pieces, so you will love it if you’re a DIY designer or a no-sew fan. You may want to use it for making leather shirts for a DIY project or costume. However, you should allow each coating to dry before reapplication of another coating. Overall, any leather or suede repair will hold up fine even if you give it a tug test by using this product. And with its correct consistency, you won’t have a hard time using it or applying too much of it, saving you money in the end. Tandy Leather is one of the world’s leading suppliers of leathercraft products and supplies since 1919. It’s been the best resource for leather item makers for quality kits, leathers, tools and various teaching materials. In the industry of leather, Tandy is one of the household names in the US and the rest of the world, capturing the hearts of the millions for generations. One of their offerings is the Eco-Flo glue, which is used by leather enthusiasts and people looking to repair their leather items. This product is water-based, ideal for use in paper, fabric, wood and leather, among other materials. It works ideally under any conditions and can provide the quick setting. The glue also gives a flexible and strong bond. It also dries invisible, so no worries it would appear. However, you must apply a thin layer on both material surfaces so that they can be glued. Then, you must press both of the surfaces using weight to glue while they’re wet. You should keep the applied pressure until the super cement dried completely. There you have what to consider when choosing the best glue for leather. When shopping around, check on the factors mentioned above, including compatibility on most surfaces, materials you’ll use for bonding it with, and bonding speed, to name a few. Finally, check on the best products above for a start when shopping around for the right leather glue today!